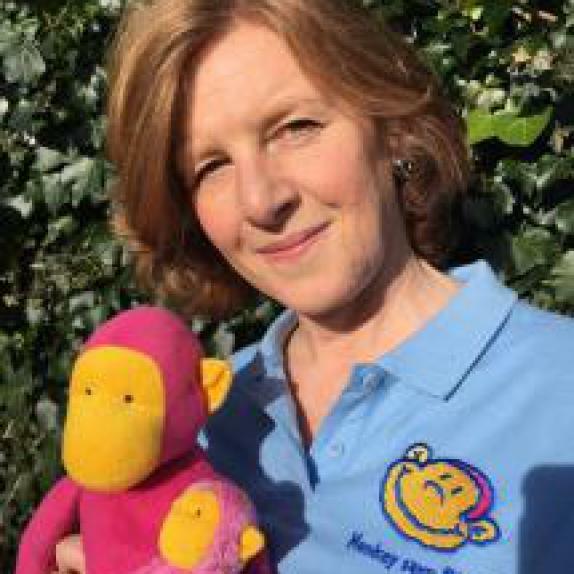 I'm Helen, and I'm still loving Monkey Music after 15 years as a franchisee! I started as a one-man band when my own children were small, and now head up a team of 4 wonderful teachers in Bromley, Chislehurst & Hayes. 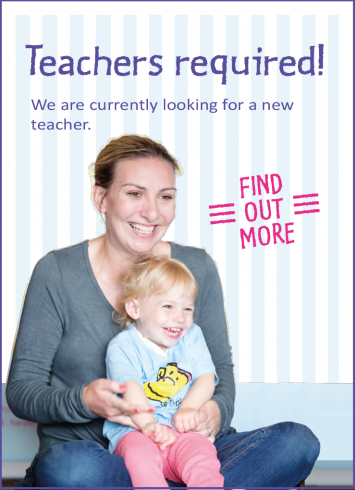 Come and see what makes our classes so special - we'd love to meet you! Before Monkey Music, I read Music at Oxford University and then had 15 very happy years as an orchestra & concerts manager. 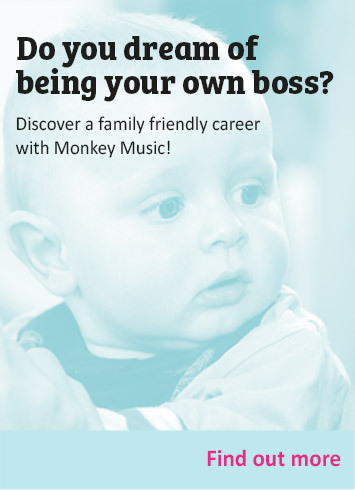 However, with a professional musician as a husband, and two small daughters, running Monkey Music classes meant I could have a fulfilling and challenging job whilst being based at home, with much-valued flexibility. As the business grew, so did my enjoyment of creating stimulating and valuable music experiences within the Monkey Music curriculum. The joy of seeing children develop their musical and social skills, make friends and grow in confidence is still very much with me. Friendships amongst parents also grow during this vitally important time, and can be made for life. Our Little Monkeys develop all the way through from Rock'n'Roll at 3 months, to Ding-Dong at 4 years, and many of our loyal families complete the whole curriculum, return for more with subsequent children, and spread the Monkey love throughout the Bromley area. Our customer loyalty is outstanding, and makes for a very happy atmosphere at classes. Our teachers are truly talented and inspiring, with boundless energy and commitment. Their love for music and the children in their classes is plain for all to see. Do book your complimentary class with us today, we truly look forward to meeting you and your child and introducing you to the fun! "I absolutely love the classes! They have become the highlight of my week. All of the babies are completely mesmerised by the sounds and instruments. Emilie loves it so much, it is definitely her favourite!" "Toby loves it! I didn't realise babies could have such concentration - the classes are just the right length for them. I have been to a lot of different classes and this is definitely one of the best"
"Over the past 18 months I have seen Evie develop and learn so much. From rhythm to sharing to marching, and more. 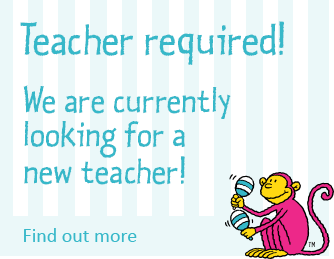 Ellie is amazing with the children and teaches with real passion and enthusiasm." "My grandson, Joshuah, is learning in a really fun way. The class is very well-structured for 2-3 year olds, and particularly helps them to listen and focus. Joshuah absolutely loves the class (and so do I!)." "I have been to Monkey Music with all three of my children and they have absolutely loved it! It has fostered a real love of music for all of them. I definitely recommend it to anyone with a little person!" "What can I say, other than FAB FAB FAB! From the moment we arrive my little girl is totally excited. Becky is an amazing teacher and I would highly recommend it. Worth every penny"
Kate made Spencer's 1st birthday so incredibly special. It was lovely for him to share Monkey Music with all his friends and family. Kate did a great job at entertaining all the children from 12 wks to 3 yrs! Fabulous fun at Monkey Music Workshops - thank you! 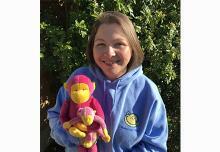 My name is Becky and I was introduced to the wonderful world of Monkey Music through classes with my own two boys. As a music graduate, and previously an opera singer, I loved the unique mix of musical grounding with LOTS of fun, and I have been having a great time running my own classes since 2014. I discovered the magic of Monkey Music 11 years ago, with my own children. I was so impressed with the way the structured classes taught musicality in such a fun way. I taught classes myself for 5 years, and now work alongside Helen in the office, keeping it all ticking along! 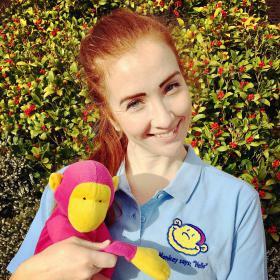 I'm Kate, and I have taught for Monkey Music since 2016. I love helping children access music in different ways, and am passionate about how the Monkey Music curriculum enables this. My background is in performing, but I now divide my time between teaching and looking after my own two monkeys. Hi, I'm originally from Scotland and have a degree in musical theatre. I recently left Phantom Of The Opera (West End), and have taught Monkey Music since 2012. Seeing the children expressing themselves through music & dance is just wonderful - it is definitely the highlight of my day! Hi, I'm Nicola. I am so excited to be teaching Monkey Music, having brought my own children to classes. As a special educational needs teacher, I have seen how important music is in developing children's confidence and language skills, and classes are so much fun. See you soon!